There wasn’t any update on Friday, seeing how I spent it hanging the artwork for the exhibition, along with spending all Saturday at the exhibition, which went great. More info and pics coming to a blog post near you. This strip is possibly the most important in the story so far, giving a flashback glimpse to how the story started (the storyline in the books) and the reason why he’s roaming around the country. More flashbacks to come over the next few weeks. 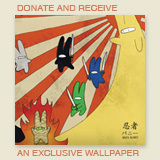 Don’t forget the next post will be Fri.
AHH DO SOMETHING NINJA BUNNY!